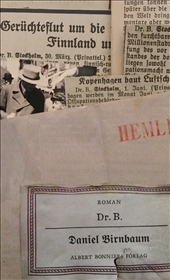 DR. B. is a work of fiction based on the larger-than-life true story of World War II drama, played out in the world of book publishing, émigrés, spies and diplomats in 1940s Stockholm, drawing comparison to Lara Prescott’s We Were Never Here. The true story behind the novel DR. B. is completely unique. It all starts with a mysterious cardboard box found in an attic by Daniel Birnbaum: within the box lies a whole life-story filled with unexpected World War drama and intrigue in the world of book publishing and international espionage, hitherto unknown to the Birnbaum family. This extraordinary story is the basis for Daniel Birnbaum’s debut novel, and the starting point for this literary gem. In DR. B. you will meet a host of legendary characters, all very real, among them the exiled German publisher Gottfried Bermann Fischer, owner of the world-renowned S. Fischer Verlag. You will also meet Daniel Birnbaum’s grandfather, Immanuel Birnbaum, who arrives in Stockholm as a refugee to start work at the Bermann Fischer’s exiled publishing house, using the pen-name Dr. B. While there, he aids British spies to spread propaganda in Germany. But in a letter written in invisible ink - something taken straight out of a spy novel - he also exposes plans of a local dissident group to sabotage a sea port. All the above compelled Daniel Birnbaum to pen a novel of rare style, panache and aplomb. DR. B. is that book.